A female Hairy Woodpecker inspects the seed feeder. 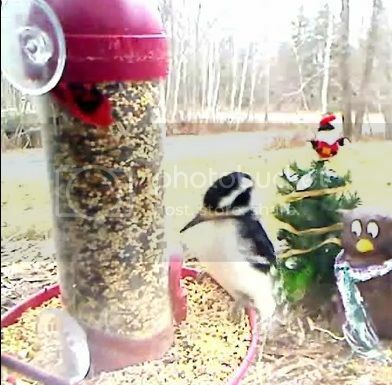 I happened to take a look at the Birdcam this morning and was surprised to see a silly Hairy Woodpecker feeding at the window feeder, rather than the suet cage. I haven't seen woodpeckers show too much interest in seed before! I don't think she was necessarily eating anything, but she stayed and checked out the feeder for some time before flying over to the suet cage. As mentioned above, the woodpecker is female. This means that I have more than one coming to the feeders now, which is even more exciting. Up until this point, I had only seen a male visiting the suet cage. The new woodpecker however, did not have a red patch on the back of her head, which told me that she is indeed a she! The next goal is to attract a Piliated or Red-bellied woodpecker! Wouldn't that be something?! Scram is home for the holidays!